Suzanne Duchamp (1889-1963)—remembered today primarily as the younger sister of Marcel Duchamp—was an accomplished artist in her own right. During her lifetime, she was also eclipsed by the fame and reputation of two other older artist brothers: the painter and engraver Jacques Villon and the sculptor Raymond Duchamp-Villon. Despite this lack of recognition, from her early years of study at École des Beaux-Arts in Rouen, Suzanne exhibited her work regularly at the various Paris salons and, in 1912, she even showed two works in the famous Section d’Or exhibition in Paris (where Cubism premiered). In 1916, she met the Swiss painter Jean Crotti, with whom her brother Marcel had shared a studio during his years in New York. Shortly after their marriage, Crotti and Suzanne established a movement they called Tabu, envisioned as a positive and more creative offshoot of Dada. For the two years that this movement lasted, they painted some of the most remarkable and inventive works of their respective careers. By the mid-1920s, Suzanne had abandoned her earlier experiments in modernism and reverted to a more conventional style, one that oscillated between an intentionally primitive or naïve approach, to drawings and paintings that were essentially faithful depictions of her chosen subjects, confined primarily to portraits, landscapes and still lifes. The present exhibition is comprised of drawings and watercolors, many of which, it is believed, were shown in a retrospective exhibition of her work held at the Galerie de l’Institut in 1952. In a brief catalogue introduction written by the critic Waldemar George, he remarked upon the intense colors and spontaneity of her brush. 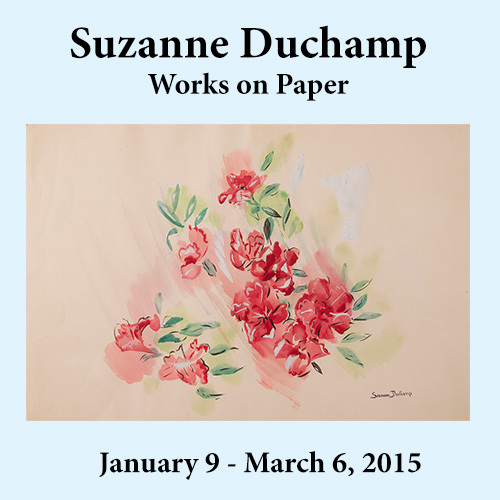 “Suzanne Duchamp has rediscovered the inspiration and creativity of the paintings of her youth,” he wrote. “The formal framework of the landscape explodes. Contours melt; strokes blur. Color pigment invades the surface. It triumphs, blossoms and becomes the sole structural element of the painted work.” Much the same could be said of the drawings and watercolors shown in the present exhibition, many of which explode off paper with colors that reflect the irrepressibly optimistic character and temperament of their creator. For some forty years, Suzanne Duchamp and Crotti painted in the same studio in Neuilly (a suburb of Paris) that Duchamp abandoned when he moved to America, and which he reoccupied after her death in 1963. Since that time, Suzanne’s work has been included in several exhibitions devoted to the Duchamp family, and her Tabu works were gathered with those of Jean Crotti for an exhibition held in Houston, New York and Paris 1984. This is the first exhibition in America devoted exclusively to her work.